The intention of this blog post is to recognize the efforts, contribution and role of early New Zealand women golfers. Much is written about the architects, courses and great men players. However, it is important to reflect upon women's initial struggles to play golf on equal footing and appreciate these pioneers of the golfing world. While the excellent play of Lydia Ko highlights today where Kiwi women have reached it was the passion, organization and leadership of women in the late 19th century and early 1900s who helped to better the game for all. New Zealand required tough people in general at this time. So how tough were the women who had to not only maintain their own lives but forge their way in a traditionally men's sport? On September 19th, 1893 Lord Glasgow, governor at the time, signed a new Electoral Act into law that made New Zealand the first self-governing country in the world in which women had the right to vote in parliamentary elections. This was progressive, considering women in the United States did not obtain the right to the vote until after the First World War. Golf in New Zealand, as in the United States, was in its infancy. The oldest clubs in each country date back to the late 1800s and were originally built only for play by men. However in New Zealand as women first went to watch the game, and then stayed to play themselves, a shared love grew. In 1896 the Auckland Ladies' Club was first formed. It is through organizations like this that golf grew an equal love. 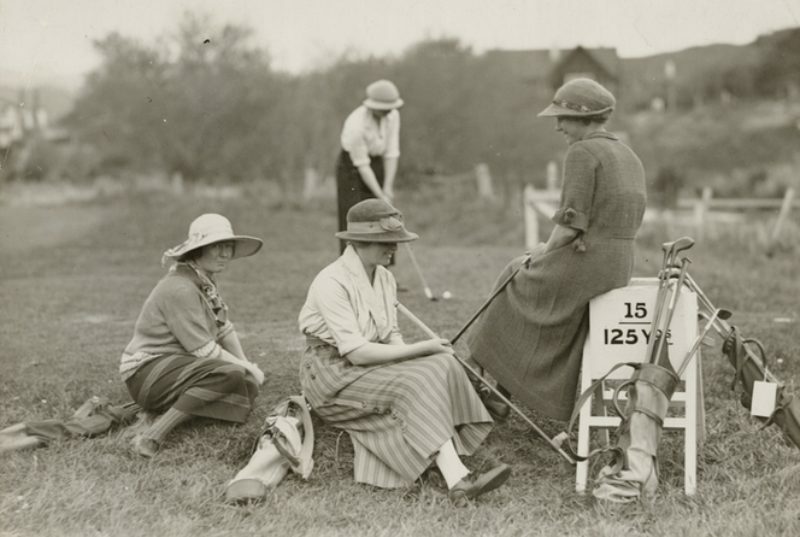 Perhaps instruments like golf helped forge an understanding between the sexes and acted as a bridge to conversations both on and off of the course? The images above show a golf tournament at Wanganui. These were photographed by Frank J Denton, between 1910-1911. Located on the west coast of the North Island, Wanganui GC is one of the oldest clubs in the country dating to the 1890s. 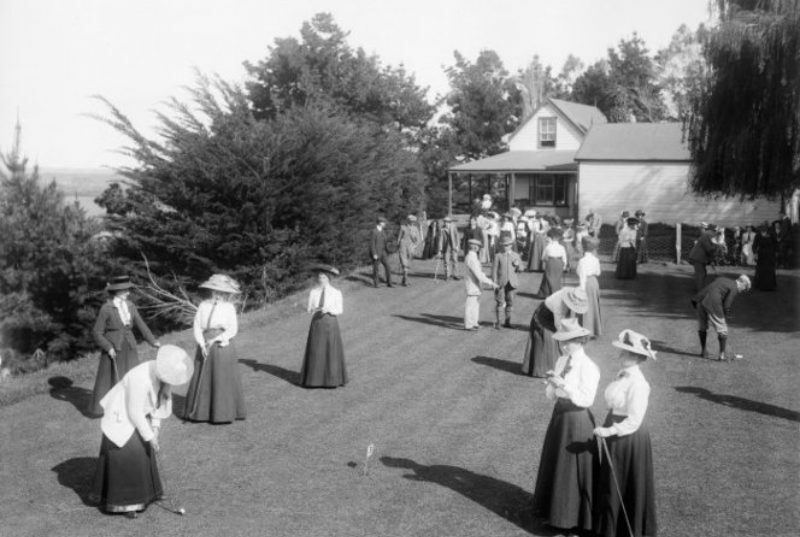 In this time rules outlining participation of women to play golf varied between clubs. While some clubs kept play separate others recognized the value of fully integrating women and men. Yet interestingly, the constitution at One Tree Hill Club in 1911 stated that "four ladies and five gentlemen together shall form the committee, a quorum to consist of not less than 5" and yet it was the women who, a year later, wished to take care of themselves. They splintered from the men and formed their own committee. The club sat at 151 men members and 150 women members in 1913. We celebrate not only their contribution to growing the game through self-governance but their uniqueness as people. With the outbreak of World War I both burden and opportunity were presented to the women in New Zealand. While men were overseas fighting, many of the clubs have women to thank for remaining viable. The social bonds between these people and the game of golf grew stronger by not only taking on tasks, like administration and course maintenance, but through continued competitions between clubs. 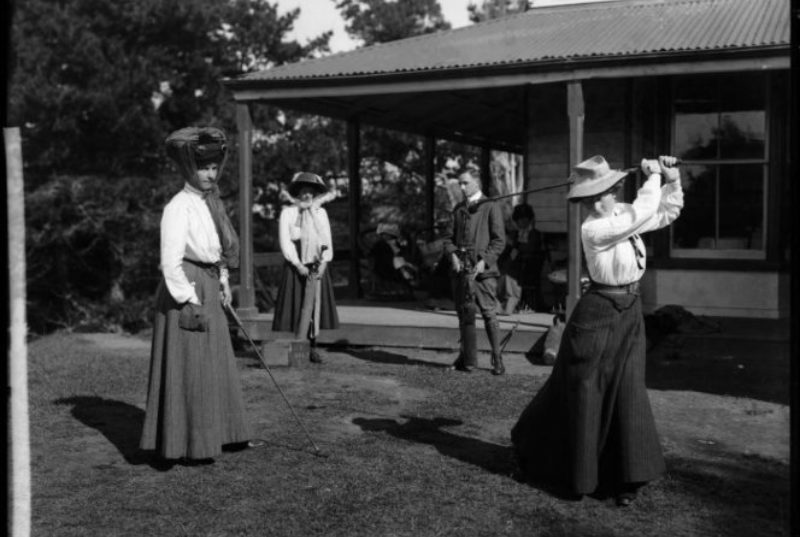 The result as the soldiers returns is that women were ingrained into New Zealand golf culture more fully. The women of New Zealand deserve to be recognized for their influence, hard work and dedication during this time. 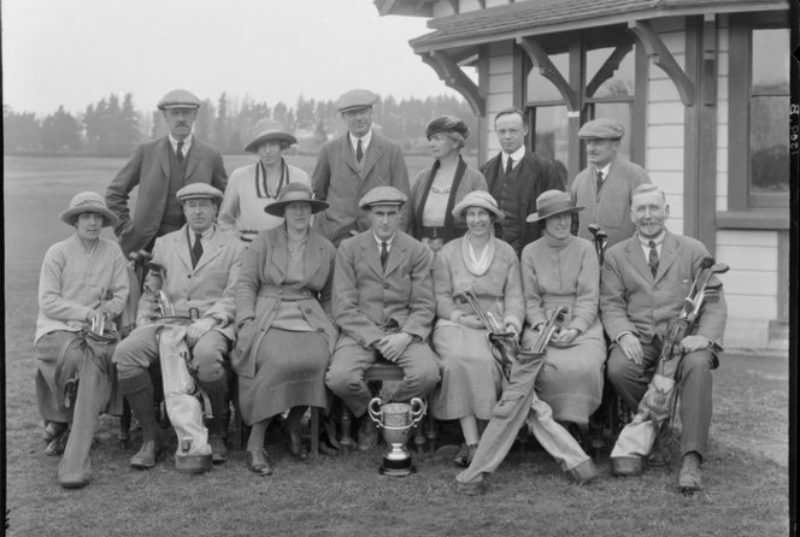 The photos above are interesting because they show a mix of Christchurch's men and women's golf teams in August, 1921. Rather than simply the men or the women this photo shows both teams integrated. Also interestingly, if we think about when these pictures were taken, this is a time just prior to so much changing in the country and the world. New Zealand's first radio stations only went on air in 1922! Yet the clothes on these women have changed from even ten years prior. And although the skirts are a little higher and hats are no longer bonnets, plus fours for women never caught on in New Zealand during this time. It likely costed the women 2-3 strokes a round. Why? Perhaps it is part of what makes New Zealand special- much of the country is focused on farming (especially at this time!). The Kiwis are not flashy by nature so perhaps plus-fours would have simply been calling too much attention to the individual. This does not stay the same even into the 1920's however. A s the country leaves the Victorian age Hollywood glamour and the more svelte ‘flapper’ look begins to influence women's style. Until the depression of the late 1920s, women will continue to experience more freedoms in not only how they dress but in their lifestyle. Opportunities for tournament play both domestically and internationally will demonstrate the abilities and expertise of New Zealand women golfers. The modern girl has, during the past dozen years, either acquired or increased her regard for:- Drinking and smoking; Paint and powder; Slang; Pastimes demanding physical vigour; Work, apart from the household variety; Individual independence and freedom of action; Speed; Late hours. Physically the modern lady golfer compares not unfavourably with men. If her muscular development is less pronounced she still has the power which many mean cannot equal and her endurance under trying conditions is beyond praise. We have seen and marveled at the indifference with which she faces rain, cold and wine which would drive most men into the recesses of the Clubhouse. Except from New Zealand Golf Illustrated editorial, 1933, ""The Women of Titirangi"